A report recently published by sociologists from the Russian Academy of Scientists, assigns a new definition to the middle class and includes civil servants in its ranks. There is an enormous gap between the incomes of the rich and poor in Russia, and until recently, there were few who were considered to have an “average” income. A report recently published by sociologists from the Russian Academy of Scientists, which assigns a new definition to the middle class and includes civil servants in its ranks, has provoked wide resistance within scientific circles. Statistically, the number of public administration employees grew by more than 20 percent from 2001 to 2011, while the number of individual entrepreneurs dropped by 13 percent in 2013 alone, currently at no more than 3.5 million people. 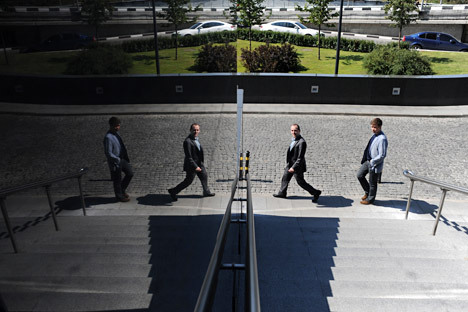 No more than 7 percent of Russians are involved in entrepreneurship. According to a recent report by the Institute of Sociology at the Russian Academy of Sciences, 42 percent of the Russian population is categorized as middle class – an unprecedented statistic for the country. However, the image of the middle class painted by the sociologists greatly differs from international standards. The core of the Russian middle class comprises employees of the state sector, and on the periphery are entrepreneurs, service sector workers, highly qualified professionals, and employees in various other sectors. The Russian middle class cannot be labelled “advanced,” per se. “In the 1990s, there was only a small group of people with average incomes, and this was rightly considered an advanced layer of society. By 2014, the majority of the middle class was loyalist and strongly sympathized with order and stability. Moving society forward was not at all a priority for this group,” said Vladimir Petukhov, director of the Centre for Comprehensive Social Research at the Institute of Sociology. Therefore, the middle class, which constitutes state servants and similar workers, may not provide for much GDP growth, but it does guarantee constancy in the elections. “In some sense, our middle class is a mirror of the entire Russian society,” Petukhov said. The predominance of the public sector, loyalty to authority, and a lack of desire to increase one’s qualifications are bizarre characteristics for a middle class. The Institute of Sociology found just the right time to publish its results, as the expert community had taken notice of this fact. There are always people with higher incomes and people with lower incomes in society, and it follows that there are people with average incomes. However, no one says that they can be called middle class. At the end of last year, the Independent Institute for Social Policy had an even stricter approach to identifying the middle class – it searched for people who, in the 20 years since the collapse of the Soviet Union, had found new ways of topping up their household budget in comparison with the Soviet period. According to its findings, only 2 percent of Russian families earn substantial incomes from property and financial assets, another 5 percent are able to live well as entrepreneurs, and no more than 8 percent had adapted to life in non-Soviet Russia. This last group is the middle class. The rest – averages in terms of income, education, non-manual labour, and self-identification – were the filters proposed by the Institute of Sociology. But in terms of sources of income and mentality, they were very different. The similarities between the society described by the Institute of Sociology and the Soviet social structure are generally obvious. If we add all employees of state-run corporations to the “state sector” category, the number of people in the middle class goes down. Paradoxically, by all statistical calculations, it is not profitable to be a civil servant in this country. According to the Centre for Labour Market Studies at the Higher School of Economics, a specialist who opts for the public sector over the private sector loses around 20 percent of his wage. However, there are implicit advantages: benefits, shorter hours, work privileges and stability, all of which puts civil servants in a position no worse than private sector employees.